At Custom Granite and Tile, no job is too small or too large. All projects are guaranteed to be completed with the highest quality raw materials. Custom Granite and Tile is committed to offering an experience and a completed project that will last a lifetime. In 2012, a 3000 square foot showroom was opened to offer a one stop shop experience for customers. Custom Granite & Tile, offers a diverse line of high quality sinks and faucets for customer convenience. Projects completed by Custom Granite & Tile, have been featured in multiple local and regional publications, award winning homes, national home improvement television shows, and has been a Gold Sponsor for the St. Jude Dream Home three years in a row. 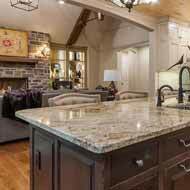 Custom Granite & Tile is an industry leading fabricator in counter top design and stands out as the premier choice for the Ozarks counter top and surfaces needs.